A crew of new entry-level employees will hit the scene this summer — or not until this fall if they’re lucky. While college graduates are well educated and often experienced on the internship front, working as a long-term full-time employee in a new company is an overwhelming experience. But there’s one skill that can make you stand out and make your transition from campus to corporate a little more smooth: communication. 1. Always err toward professionalism. Speak as eloquently as you can. This takes practice so start now. Forget the “umms” and the “likes.” It’s better to think in silence and gather your thoughts than blurb out a bunch of nonsense. Remember your interview? That’s how you want to speak, especially during meetings. You don’t want to sound like a robot, but you also want to continually impress those who hired you. Because most people err on the side of professionalism, it may be hard for some to express their true feelings, especially during a meeting. Pay attention to non-verbal cues and acknowledge them in an appropriate way. Ask intelligent questions if you think someone does not look happy with a decision — or looks unimpressed with your work. Name one person who’s not impressed with someone who’s remembered their name? 😉 In all seriousness though, it’s very important to remember names at work. Outside of work, remembering someone’s name might be seen as a skill, but inside work it’s expected. What other communication tips would you add? Do you use Tinder? It’s the swipe-left, swipe-right dating app that simplifies the overwhelming process into a quick yes-no situation. If one party swipes yes and the other party swipes no, a match will not be made. But if both swipe yes, the parties are e-introduced. A new app called Jobr hopes to do just that — but this time for jobs. Imagine a recruiter on one end and talent on the other. Kind of genius, right? Jobr’s tagline is “Connecting talented individuals with the job they never knew was waiting.” After all, sometimes you might not know what’s best for you. Or you might find what you’re looking for in the least expected place. (The parallels between job searching and dating suddenly are very clear, right? Read our post discussing how job searching is like dating if you disagree.) On top of that, searching online for open positions can be exhausting. And application after application — just like date after date — is time consuming. To use Jobr, just connect your LinkedIn profile to the app. A profile will be created with your most proficient skills and your job history. Each open position also has a profile page outlining job requirements and the qualifications needed for success. Swipe left or right whether you’re interested or not. If you are, hopefully a recruiter is interested to. P.S. If you know of a friend who’d be a good fit for a position, share the listing with them. If they get hired, you’ll score $1,000 from Jobr. Not bad. What if you walked into an interview and they handed you a video game controller? That’s not too far off from the latest trend in hiring: gamification. Employers are realizing more and more that there’s more to a person’s story than their resume. A one-page document is not always telling when it comes to the skills and intuition needed for certain positions. That’s where the video games come into play. Marriott recently tried this tactic with a Farmville-like game in hopes of recruiting talented hospitality individuals. The project wasn’t a huge success, but the concept is intriguing. Other companies like Facebook and Google offer coding challenges and contests for a chance to land a position — or at least get noticed by the hiring staff. Still others are turning the application process into a Foursquare-inspired situation filled with badges for those who go far. Think of each step of the interview as a new “level” the applicant unlocks. In the future, companies may move towards a more creative “pitch” approach, where potential employees prove their skills with a relevant concept or idea or job proposal instead of just a resume. What do you think of this new trend? Read more about gamification at Mashable and Entrepreneur. We’ve touted the benefits of informational interviews before. Why? Because they’re an excellent networking opportunity. (Read our past post called What Does Networking Really Mean?) It’s important to remember that networking is not limited to the job searching process. Employees should be networking at all moments throughout their career — externally and internally. That’s right. Your coworkers and supervisors count toward your networking goals. In fact, they are a great resource for informational “interviews.” The term “interview” is used loosely here but it’s still relevant. If you’d like to be promoted within the company or switch departments, a coffee date or lunch break with a respected coworker can pay off big in the long run. Want to one day run the department you’re in? Set up a meeting with a vice president or director. It’s okay if you’re only an entry-level employee right now. They’ll often respect your determination and interest in a future within the company. It never hurts to have friends in high places. Want to learn the business better? Set up a meeting with someone from a department that you work closely with. They’ll be more than willing to explain how their role and your role can complement each other. Making connections with other departments can make your daily work duties run more smoothly down the road. Read our post on 5 questions you can ask during an informational interview. These questions can be slightly tweaked to work for an internal informational interview. Can Facebook Profiles Predict Work Performance? Experts Say Yes. You’ve heard the warning before — some employers turn to Facebook and other social networks as part of the recruiting process. A recent study conducted by researchers at Old Dominion University in Norfolk, Virginia called “Incremental Validity of Social Media Ratings to Predict Job Performance,” found that your Facebook profile might be a better predictor of your job performance than any personality test could foretell. As you’d imagine, we’re much more honest in our Facebook profiles than we are when taking a personality test. And personality tests are an excellent indicator of job performance. In the study, 146 undergrads were given a personality test. At the same time, a team of observes examined the participants’ social media profiles and looked for characteristics such as agreeableness. In the end, the characteristics drawn from the self-reported personality tests turned out to be not nearly as truthful as those pulled from the social media profile observations. It’s not a surprise. We often report ourselves in a better light, especially during a job search. But on Facebook, we’re willing to share anything and everything. Read the full findings over at the DailyDot. FastCompany recently wrote a piece on What Casual Learning Can Do For Your Career. As expected, learning is good — even after you’ve graduated. And it turns out you don’t need to go back to school full-time or pay for an expensive class to up your ante. From the quick-hit TED Talks YouTube channel to the more lengthier TED Talks podcast, Ted.com is the place to turn to on the Internet for incredibly interesting discussions on work, life, and the future. Their short-and-sweet videos can also currently be found on Netflix. You’d be surprised how much your way of thinking can be changed in just 15 minutes. Those seeking to expand their minds can find a free lecture on just about any topic thanks to iTunes U. The app gathers podcasts from leading universities around the world and calls itself the world’s largest catalog of free education content. Learn languages. Learn physics. Learn how to write. There’s something for everyone. Knowing how to code is a hot skill these days and you don’t have to be a computer science engineer to learn how to do it. Code Academy is one of the many resources on the web that teaches programming basics to everyday people for free. This particular website teaches users in an interactive way, which makes learning fun — and you might be more likely to stick to it. This one is a two-way street. You need to feel respected and you need to feel that your superiors deserve respect. Coworkers don’t need to be best friends, but they do need to appreciate the abilities, talents, and work ethic of those around them and those above them. Whether you’re constantly learning a new skill set or you’re climbing the career ladder, growth can come in many forms. The human resources department often offers interesting classes for all employees. Your boss might approve a conference or webinar that’s relevant to your job. And your superiors may be willing to transfer you to a new department or promote you to a new position if you can prove your abilities. Sometimes all you have to do is ask. When it comes to your schedule, you may feel stressed out or overwhelmed. But there’s one thing you do have — hopefully — and that’s control. Control means different things to different people. Perhaps it’s the flexibility to leave early occasionally for your kid’s event. It might mean being able to take two weeks of vacation each year. Maybe the option of working from home on Fridays is imperative. Figure out what is most important to you. As far as the social media job search goes, you’re obviously familiar with LinkedIn. You likely have found a job and maybe even got hired via the professional social network. And you’ve maybe dabbled in some Twitter career recon. Perhaps you’ve done some 140-character networking that led you to a job interview. But have you ever thought of using Pinterest to help you land a gig? Pin your social networks like Twitter, Facebook, and LinkedIn. Just make sure they’re all cleaned up and looking professional! Pin your website or your bio on your current company’s website. 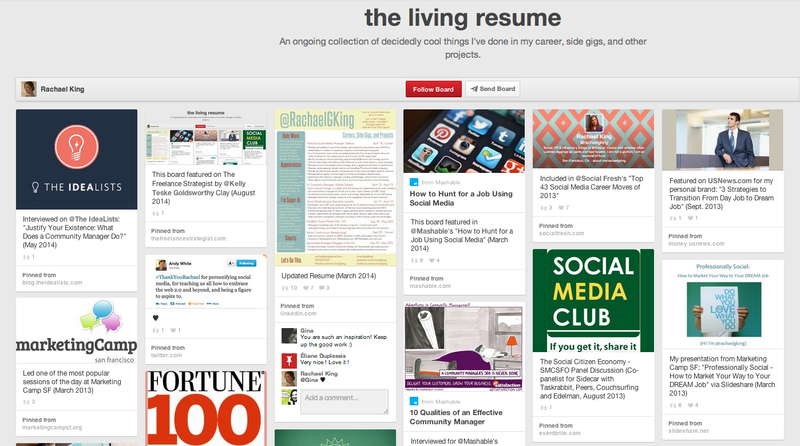 Pin any articles or blog posts you’ve been interviewed for or mentioned in — or written yourself. Pin the logos of the companies you’ve worked for. Pin the logos of the schools you’ve attended. Pin images of yourself doing cool things like volunteering. Pin images of awards you or your company has won. Pin images of your hobbies and any organizations you’re involved with. Not on Pinterest? No worries. Sign up now.